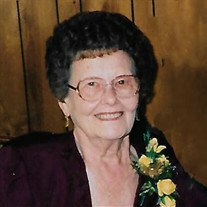 Vivian Nave, 94, of Vandalia, Illinois, formerly of Ramsey, Illinois, passed away Thursday, October 11, 2018, at Fayette County Hospital, LTC, Vandalia, IL. Services will be held at 11:00 AM, Monday, October 15, 2018, at First Baptist Church of Ramsey, Ramsey, IL, with, Pastor Jeff Shouse officiating. Burial will follow at Ramsey Cemetery, Ramsey, IL. Visitation will be held from 10:00 AM to 11:00 AM, Monday, October 15, 2018, 1 hour prior to the service at the church. Memorials: First Baptist Church of Ramsey, Ramsey, Illinois. Born January 26, 1924, in Bayle City, IL, the daughter of Zach & Maude (Craig) Ulbright. Married Joe Raymond Nave on October 19, 1947, in Ramsey, IL, he passed away May 1, 2016. She was a Homemaker, an avid quilter, and loved being with her grandchildren. Survived by: Daughters - Judy Roberts & David and Sharon Stanbery & Rick, all of Vandalia, IL; 4 Grandchildren - Matt, Darren, Brooke & Marisha; 8 Great Grandchildren; and 1 Sister - Mary Louise Otto & Anthony, Bingham, IL. Preceded in death by: Parents; Husband; 2 Brothers - Earl & Zach Jr.; and Sister - Evelyn Meador.